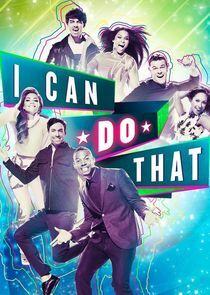 NBC puts six celebrities to the test in its new one-hour comedy variety series, I Can Do That. Comedian-actor-producer Marlon Wayans ("Scary Movie" franchise) serves as host. Six of America's brightest entertainers come together to compete and showcase their talents with breathtaking and unique acts - featuring skills they did not even know they had. Joining Wayans for this summer series will be acclaimed dancer and choreographer Cheryl Burke ("Dancing with the Stars"), superstar recording artists Ciara, Joe Jonas and Nicole Scherzinger, national stand-up comedian Jeff Dye ("Last Comic Standing") and actor Alan Ritchson ("The Wedding Ringer"). Each week, in front of a live audience, the six cast members will enter a friendly rivalry as they choose their favorite act - what they think they can master - and who they would like to pair up with to master that act. The acts will span every variety of entertainment from song and dance to magic and danger. They will also feature some of America's biggest-name performers in guest-starring roles. With their acts selected, the duos make their way into the training studio, where they work with their expert coach for five days to produce an amazing act to perform on the next week's show. After a week of intensive training, the celebrities return to the stage to perform their act in hopes of scoring the top slot on the night's scoreboard. With no judges or eliminations, I Can Do That allows the cast to show off their untapped talents and enjoy a little friendly competition along the way. After six weeks of exploring their own unique talent range, one cast member will be revealed as the season's ultimate entertainer.